Should I Self Manage My Investment Property? Should I Self Manage My Investment Property? Self leasing your investment property can save you thousands of dollars. But should you self manage your investment property or is it smarter to pay a rental manager? Should I self-manage my investment property? Self-managing your investment property can save you money. In fact it can save you a fair amount of money. So is it worth actually paying a rental manager in order to do all that work for you? Or are you better off doing it yourself and saving that money and using it either towards your lifestyle or either towards growing your investment portfolio or paying off your mortgage? First, let’s have a look at how much you’re likely to save by self-managing or self-leasing your investment property. Generally you’re going to pay about 6 to 12% of the weekly rent to a rental manager, plus you’re going to pay 110% of one week’s rent every time you need a new tenant in that property. So if a tenant leaves and you need to find a new tenant you’re going to pay 110% of one week’s rent. So what does this looks like? Well at $400 a week, if your property’s renting for that much and the rental manager is charging you 8% that would be $32 per week that you would be saving. That equates to $1,664 per year plus $440 every time you need a new tenant. So if you need a new tenant once during the year then that would be over $2,000 that you could potentially save by self-leasing or self-managing your investment property. But it does come with a cost. There is a bunch of things you need to do in order to self-lease your investment property. You need to advertise that property to make sure that potential tenants find it and can apply for the property. You need to go through and you need to choose the best tenant. You need to do the background research on your tenant, you can do kind of like credit checks but tenancy checks. You need to call their work, call their references. You need to choose the best tenant. You need to organize all the documentation that goes with the lease; so you need the lease agreement, you need the inspection reports, you need to provide the tenant with the booklet and then there’s also documentation for every time you want to inspect the property, every time they are late on rent, all of that sort of stuff as well. So you need to organize that documentation, have that prepared and know what to do with that. You need to manage the rent payments so you need to make sure that rent is coming in and that you’re getting paid on a regular basis. And obviously if rent is delayed then you need to follow up on that as well. You need to do regular inspections of the property. Rental managers generally do inspections approximately every three months, three to four months, something like that. Therefore consider doing inspections as part of your job and part of saving that money because you don’t want the tenant to be in there for a full year and then you find out that the place is completely destroyed. Going in and doing these regular inspections you can ensure that the property is kept up to standard and also you can address any problems that may arise. You also need to handle conflict resolution. So people have damaged your property or if they’re not paying their rent on time or if you have other issues with your tenants then you’re going to need to resolve conflict. Now, that might be providing them with a letter or letting them know the rules and might be taking them to a tribunal and taking them to court for these sorts of things. You are therefore going to need to handle all that sort of stuff. Hopefully for you that won’t happen. Conflict resolution is kind of a rare case but it does happen and it’s something that you need to be prepared for. You also need to handle all the repairs of the property. So either you’re doing the repairs yourself or you’re calling up the handyman to get the repairs done. Calling up the plumber or calling up whoever is going round there to fix those repairs. You might also need to go out there and do quoting; finding out how much the new hot water heater is going to cost and doing shopping for the property for the repairs as well. So there’s a whole bunch of things that you need to do if you want to self-lease your rental property. So, should you sell manage your investment property? It depends whether the money is worth it to you or not. The 6 to 12% of the weekly rent and 110% of one week’s rent. Is that better for you to save that money which might look around $2,000 per year? Or is it better for you to take a hands-off approach, have a professional manage that for you so you can focus on growing your investment portfolio rather than focusing on managing the one or the two properties that you do have? It’s therefore really up to you whether you think you should do it or not. I think it really just comes down to whether you want to put in the work and that’s where you want to be putting your effort or whether you want to pay someone else to do it so that you can go ahead and you can focus on other things. That might be living your life or it might be growing your investment portfolio. It’s also important to note that if your property is a long distance away from you then the chances of you being able to self-manage it successfully is very small. It’s very difficult to self-manage your investment property if you live a long way away. So if it is a close by property then it may be something that you want to do but it’s really far away then you would definitely consider actually hiring someone to do it for you. If you do want to self-lease your property I have created a product over at www.leaser.com.au where you can get a self-leasing kit and you can get all the documentation that we need to lease your property as well as some instruction videos on how to best advertise your property and how you can vet tenants and do those background checks on tenants that I talked about. So that’s it www.leaser.com.au. 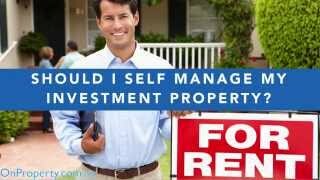 I hope that this has helped to answer your question, “Should I self-manage my investment property?” The answer is going to be different for every person so I hope that you make the right decision for yourself.